I’ve received so many kind messages about my last post; a children’s leggings pattern and tutorial on how to make leggings or footless tights. 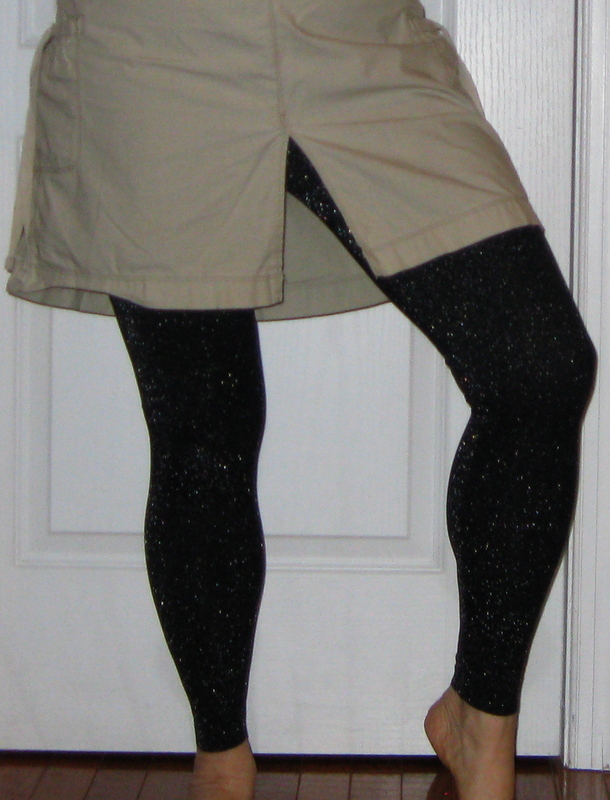 I also included directions on how to make a pattern for adult-sized leggings but stopped short of a pattern. This week I made a pair for myself, as I’ll need them for our upcoming trip to Central America. Why not create a pattern and share it with you? 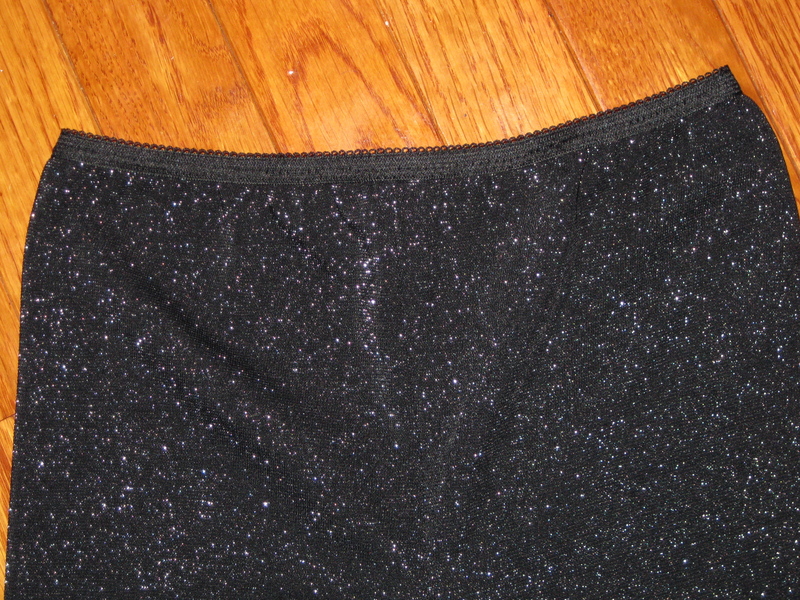 The fabric is black/silver spandex – nylon and spandex or lycra, I think. Since there was more stretch with the grain, I cut across the grain. That is, the selvage ran across the top of the tights. First of all, here is the pattern, which is for an adult size medium. 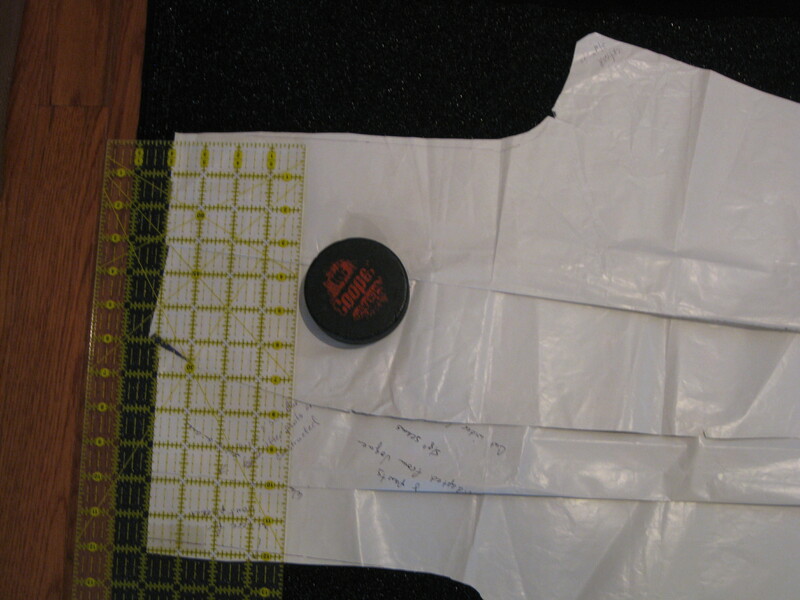 This is “low tech” pattern making with hand written instructions. All you need to do is to print the 10 pages in the Adult Leggings Pattern sz med pdf and tape them together following the grid on page 1 of the pattern. In order to fit well and stay up, the hip size of the finished leggings is about 2/3 of my actual size. The finished hip circumference is 28″ and my actual measurement is 40″. The legs are closer to my actual size. 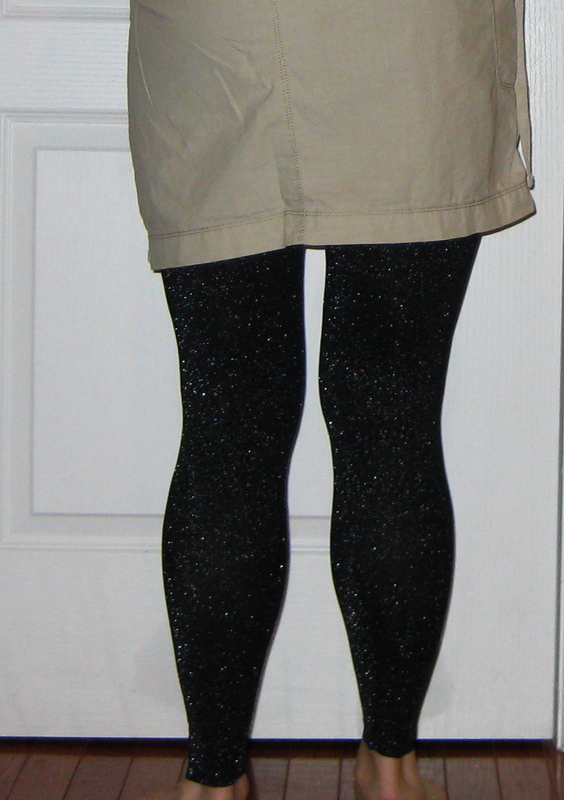 At the top of the inseam, the finished leggings are 18″ circumference against my actual size of about 22″. At the ankle, the leggings circumference is 7 3/4″ against an actual ankle measurement of 8″. 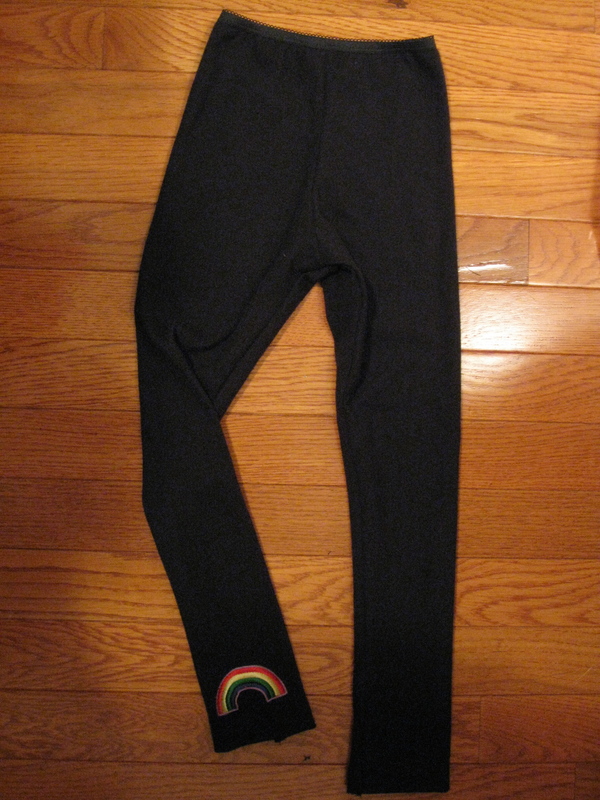 Length – my leggings inseam is 27″ which is 1″ shorter than my pants inseam. You may need to lengthen the pattern as most of the world is taller than I am. That’s just how it is! If you need to alter the pattern, make a split down the middle of the pattern, which would be at the side seam (if there was a side seam). 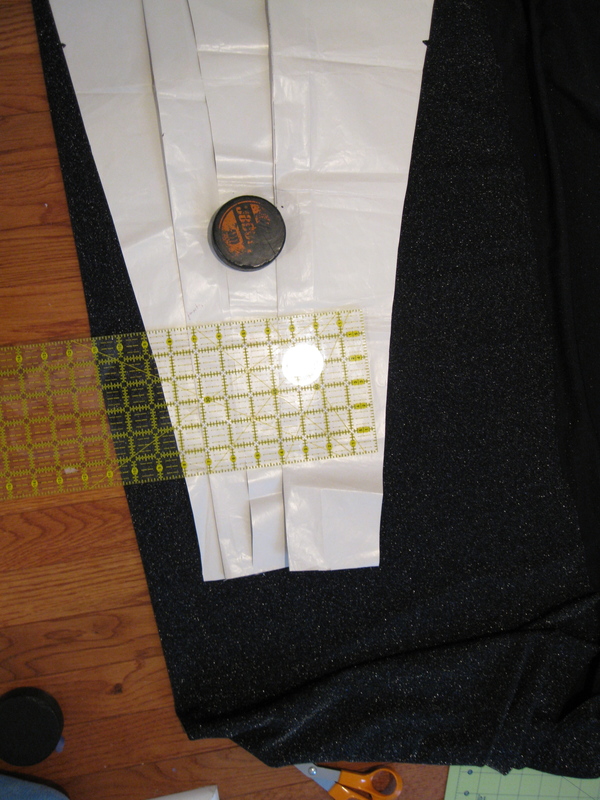 As you can see from my’m hoping this will give you an idea of how much to split the pattern. The nice thing about using lycra or spandex is that it’s forgiving and your measurements don’t need to be exact. As with children’s leggings, apply the elastic with a zig-zag stitch. Pull the elastic so it is slightly smaller than the top of the tights. Here are several more photos of the completed project – these are incredibly comfortable to wear and will be just what I need for our upcoming trip – they will double as tights, long underwear and maybe PJ’s too. In the N. Hemisphere it’s winter and that means it’s time for females to cover their legs. Well, maybe not all females; even in the depths of winter we all see young women and teens with bare legs but not me. So I say it’s time for leggings; a fast sewing, get results in minutes item for the winter, mostly for my granddaughters but also for my daughters. I’m talking about the footless “tights alternative” as opposed to the ever popular leggings which are more of a “pants alternative”. The web is full of photos and comments about whether it is appropriate to wear leggings in lieu of pants. Rest easy in that we’re not touching that fashion controversy in this post. My 2 GD’s absolutely love the leggings I make for them. They wear them as tights under skirts or dresses and as an additional layer under pants, especially during very cold weather. Since they’re inexpensive and very easy to sew, I often make 8 or 10 pair at a time and they are delighted when I arrive with package in hand. Length of 2-way or 4-way stretch knit fabric. I often use spandex or lycra which would be used for leotards or dance-wear but also use other cotton or cotton-poly stretch knits, often to match a t-shirt or top. The pattern is a size 2-4. 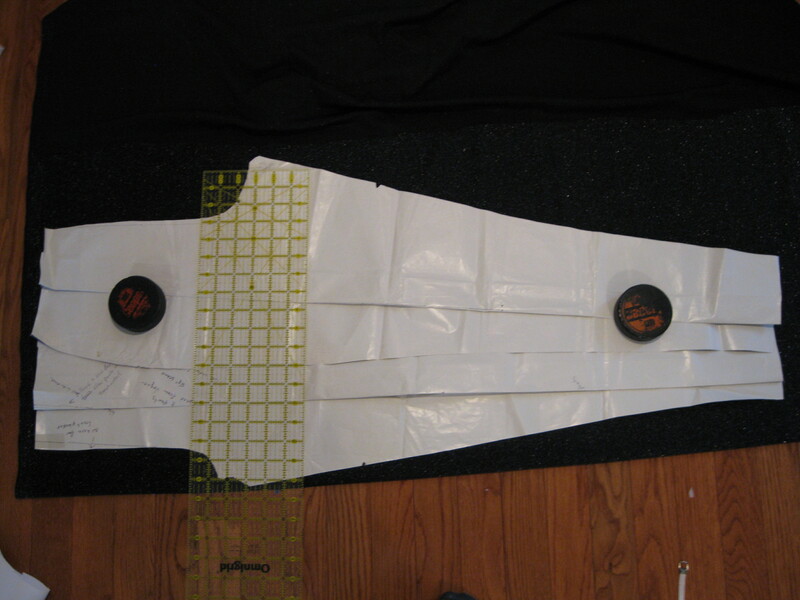 In order to make a larger size (girth), split the pattern down the middle and add 1/2-3/4″, depending on the amount of adjustment needed. This works well great for girls who need a little more sizing but no more length. To make a size larger such as a size 4-5, make the same split down the center of the pattern piece and add as much length as you need. No worries if you make it too long, you can just cut the bottom off later. Cut 2 identical pieces from the pattern. Generally when cutting fabric I try to avoid the need to cut against the grain, for leggings you want to have the greatest stretch across the garment, not lengthwise so the leggings are comfortable with movement. If possible, cut with a rotary cutter. It goes much faster and makes a nice clean-cut at the bottom. 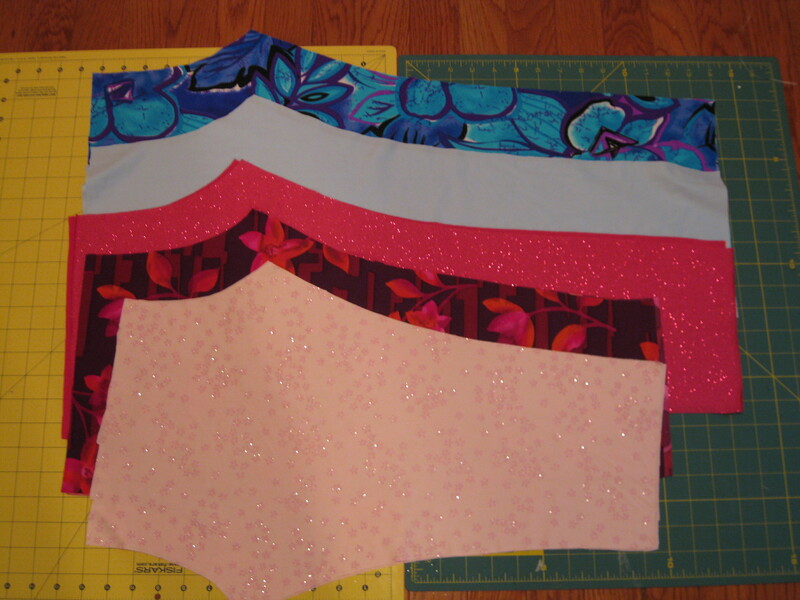 Here is my mass production – 3 pair for my Mira and 2 for Cate. Yes, there will be comparing when I arrive with clothes in hand but I’ll make sure they each have the same number of pieces of clothing! 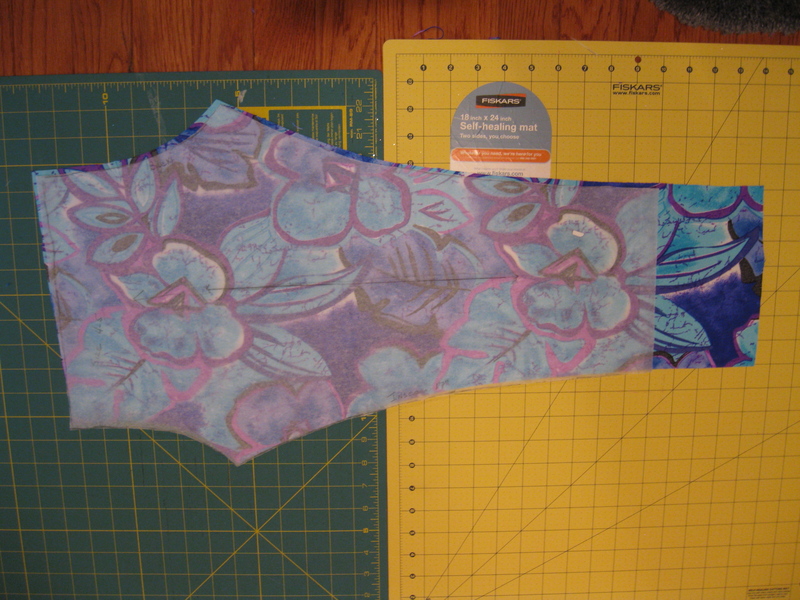 Serge (or use a lingerie or knit stitch on a standard sewing machine) center front and center back seams. A straight stitch will not work for this as the seam will rip out during wear. Serge inseam in 2 steps. Start at the mid-point of the inseam and stitch toward the leg bottom. Then sew the second leg. (The reason for this 2-step process is that when starting the seam, the serger has a difficult time keeping the bottom fabric even). Or maybe it’s me? This has probably taken 5 minutes of sewing time: You now have nearly completed the leggings and just need to add the elastic. Sew the elastic using a zig-zag stitch. (You could use a coverstitch but I find that zig-zag works just as well and it’s much faster). As you can see in the following photo, the elastic needs to be slightly smaller or tighter than the waist, otherwise they won’t stay up. Mira and Cate are both pretty slim, so keeping them up is a problem if the rise is to short or if the elastic isn’t tight enough. If using lycra or spandex, I usually leave the bottom unfinished. If using cotton-poly-stretch, a narrow rolled hem works well. The other step I take is to secure the bottom of the seam with a few stitches. Or you can tuck in the serger threads. The purpose is to keep the bottom of the seam from opening during wear. 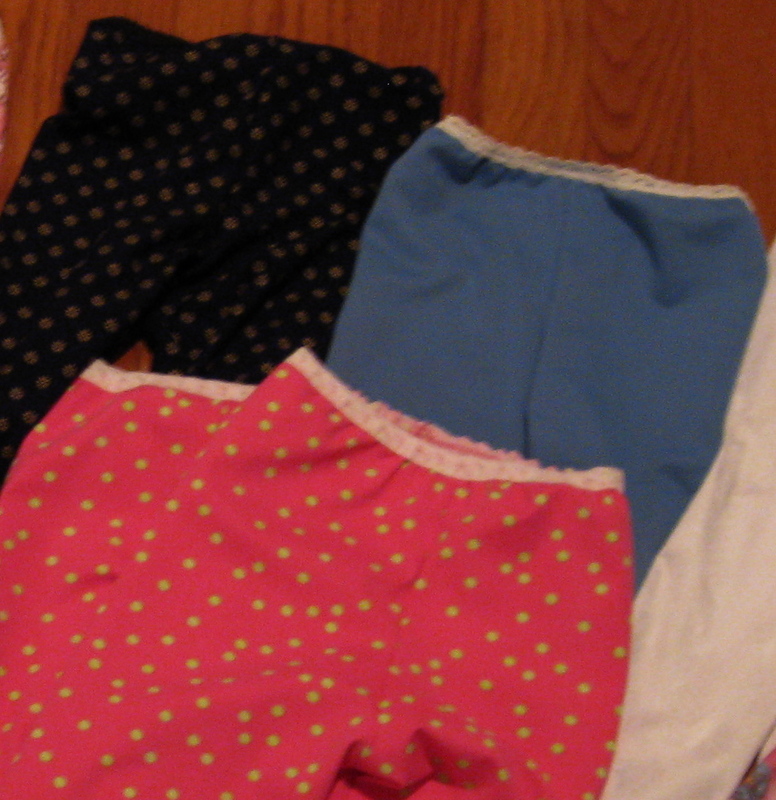 Here you see a photo of about a dozen pair I made a while ago. 1. Take a pants pattern front and back and tape or pin together at the side. 2. Tuck or fold the pattern from top to bottom to reduce the width of the pattern. In this case, I aimed for the pattern to be 3/4 the size of my daughter’s actual measurements. 3. Shorten the rise so it is slightly shorter than the measurement of the person who will wear these. 5. Cut and sew in the same manner as the children’s leggings. If you have access to 1″ lingerie or fleece-backed elastic, it words well. I would stay away from the harsh elastic for general use.